Miles Morales (on the left) first appeared in the Spider-Man comics in 2011. A new universe. 900 characters at your disposal. It’s the sort of thing super fans dream of. But for Spider-Man, it’s now a reality. In an interview with Variety, Sony bosses announced an eight-year plan for the Spider-Man franchise, hinting at a load of new characters and even a television series. “I think a television series is a great idea. There are so many characters you could delve into,” Claire Lim, contributor to the BBC’s The Social, tells Radio 1 Newsbeat. Claire says his flaws make him one of the most-loved characters in Marvel’s universe. 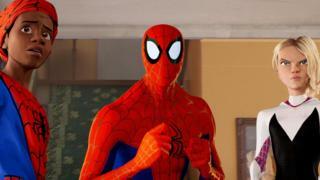 Spider-Man: Into the Spider-Verse is the first animated theatrical Spider-Man feature. Sony is looking to build on the success of recent Oscar-winning Spider-Man: Into the Spider-Verse, which brings back to life comic book characters that fans thought were forgotten. One of these characters could soon lead their own series. “We’re pretty far down the road in terms of working through which characters we think could be their own star of a television series,” Mike Hopkins told Variety. Peter Parker, the “Spider-Man we grew up watching” should have his own show, Jon Arvedon, associate editor of Comic Book resources tells Newsbeat. It’s a “boring answer”, Jon adds. GameSpot UK editor Tamoor Hussain wants to see Doctor Octopus centre stage. Not as the villain – but “where he is in the body of Peter Parker”. A fan of Tom Hardy in Venom, Uproxx film writer Vince Mancini believes the anti-hero should be given his own series. Claire Lim wants to see the series appeal more to a wider-audience. “I’d 100% love to see Spider-Woman on screen, I think Spider-Ham could be super fun for kids,” Claire says.